Dr. Mandy Leung loves working as a general family dentist. It allows her to build lifetime relationships and friendships with her patients, and become part of their life as they become part of hers. Dr. Leung feels that dentistry offers the opportunity to positively change peoples’ lives in many ways. She is able to relive a patient’s pain and make it possible for them to eat comfortably. She’s also able to restore a patient’s smile and make it possible for them to once again smile with confidence. 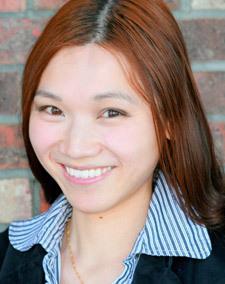 Dr. Leung feels blessed to be a dentist who can make a difference in each of her patient’s oral health and wellbeing. Particularly passionate about preventing dental disease, Dr. Leung spends time talking with each of her patients about their unique oral health. She helps them understand how to develop good home care routines, establish healthy habits, and make good choices that improve their dental health and overall wellness. Understanding that oral healthcare is a constantly changing profession, Dr. Leung participates in many continuing education opportunities. She attends lectures, and participates in discussion groups and hands-on workshops, which keep her current on techniques and technology. She has studied: Invisalign®, preventive and restorative dentistry, periodontics and endodontics, orthodontics, and dental medicine, to name but a few topics. Born in Hong Kong, Dr. Leung grew up in Alameda. She now lives in Dublin, with her husband and young daughter and son. When not working, Dr. Leung loves to spend time with her family. She feels that being with them is the best gift. She also enjoys teaching children’s Sunday school classes, and loves to travel, bake, and draw.